Top prize in the NZIA New Zealand Architecture Awards last night in Auckland went to Ironbank, by RTA Studio. Fantastic building, stunningly iconographic, and well-deserved. It’s a tour-de-force of the art of the architect – yes, agreed that perhaps the structural logic could be argued to be, shall we say, “overly complex” – but its a building that you just can’t help but like. 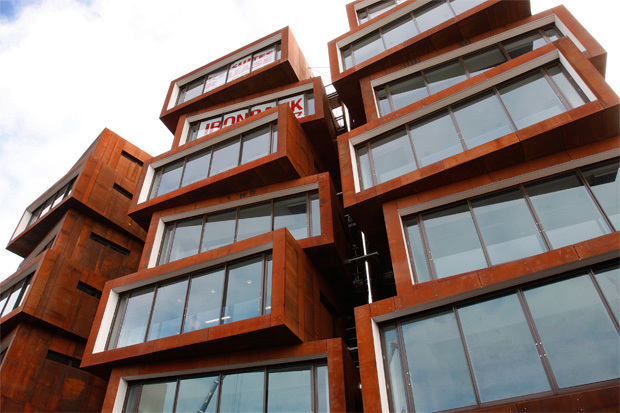 The dark, rusty red exterior takes the cake as well, with the sun hitting it it glows, and the steel cladding (Corten?) has a crispness that goes well with the boxy shape. Massive congratulations to RTA, and their Engineers (who are? ), and of course, most of all, to the client, Samson, who paid for all this. It could be argued that this is the first real modern piece of architecture in Auckland. Maybe that’s Architecture with a big A, and modern with a small m. Up until now, the commercial architecture of the Queen city has been unmitigated dross on the whole, much as is most of Wellington. Finally, there is now a reason to go to Auckland, just to see a building. I mean, you’re not going to be rushing up there to see the Aotea Centre, or the Price Waterhouse building, or the Vero Centre now, really, are you? But it is also notable that most of the projects awarded NZIA New Zealand Awards for Architecture (the runner up to the New Zealand Architecture medal that Ironbank got, which is the real gold medal prize), are from Auckland. There was not a single award for a Wellington building, even though Gerald Parsonson, the lord chief justice of the awards jury, is himself from Wellington. You can read the full list here, on the NZIA website. As usual, commentary in the Stuff daily papers is pretty poor – one tiny advert in the DomPost yesterday, and a whole swathe of photos in the NZ Herald. It’s a timely reminder that we have yet to pull off something similar in terms of world class quality in Wellington. Hmmm, people come to Wellington to see the ground where hobbits walked, but will they have been coming here to see the Maritime Tower, or the new BNZ centre? Meridian building maybe, but in terms of tall towers, we’re pretty vacant really. Actually, speaking of pretty vacant, there is a fairly amazing difference between Auckland and Wellington in terms of office vacancies, and the attitude towards the letting of space. There’s a building at the bottom of Queen St, just called 21 Queen St (formerly Downtown House), which has just been massively refurbished by Peddle Thorp, and yet it is still unlet. Perhaps, even, apparently, unlettable – as it doesn’t have carparks. That’s a scandalous state of affairs – that the idolatory of the car is so ingrained into those ingrates up there that they won’t rent the building unless the boss can drive to the door – after all, it sits directly opposite the main Britomart railway station in Auckland, has a million buses departing every day on its door step, and a fine fleet of ferries just a stone’s throw away, and yet the lazy-arse Aucklanders won’t take it on because the basement isn’t there for their beemers. Sad, sad, pathetic city. The real concern about the state of Wellington’s architecture is the reasonable presumption that on average it will be publicly-funded, publicly-accessible buildings which will create the opportunities for truly remarkable design and that Wellington has had a capital city share of those. You’re talking about the state of commercial architecture in the city, but is anybody coming to see the architecture of the Supreme Court or the Ministry of Defence? Is anybody in the least bit sorry that the National Library re-skinning exercise has been shelved? (It has. hasn’t it?). Te Papa? Let’s not go there. Without the restraints of developers’ tightly-tucked spreadsheets, surely the possibilities of Gold Medal architecture go up, not down? I have just been in the Netherlands and the quality of their recent museum and library building was enough to make me truly glum about the state of things at home. Sure, there’s been a lot of (probably highly indebted) euros sloshing around there, but it seems like something more fundamental than that – something almost paralysing about bigger scale and bigger budgets which too often leads us to a kind of expensive banality. Or do we blame it on the tyranny of the committee? Perhaps I’ll watch “Getting to Our Place” a few more times. m-d – isn’t one of the principal arts of an architect that very ability to make a visually compelling building? But granted, there should be more to it than that. 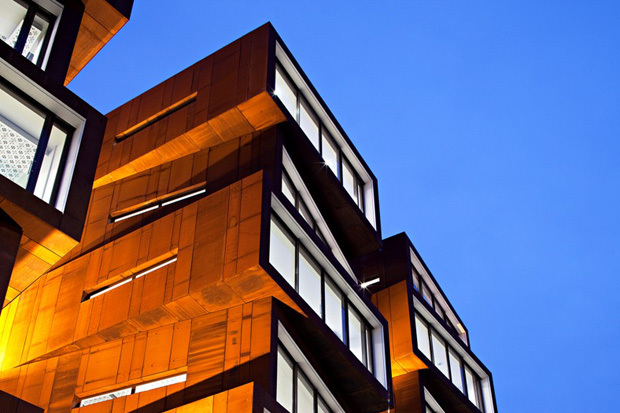 The Ironbank building is, by all accounts, a very individualistic piece of work. There is, entombed inside somewhere, a rising car stack of gleaming autos, that the NZ Arch magazine article revealed to be almost as robotically hypnotic as the external facade. You do have to wonder however how much the need for separate units has driven the look of the building. By all accounts, the building is not completely let yet – let’s hope that it is let fully before too long, or that will lay quaestions as to the suitability and practicality of the architecture. and Starkive – I’m sure you’re right re the sloshing of euros – but a population in Netherlands some 10 times ours, on a land that is some 7 times smaller, is bound to have some effects too. We don’t really have that much use for more public buildings, do we? Ministry of Dance? International Peace Palace? Which Library and Museum are you talking about? The Central Library at Amsterdam presumably? And the Library? Did you get to see the the Netherlands Institute for Sound and Vision in Hilversum? That place is a blast ! – and would be right down your alley. I hope you took pictures so that we can post them on line…. Strange that the rest of the country thinks Aucklanders don’t like PT. I think Aucklanders are pretty darn keen to get out of cars; sitting in traffic jams isn’t much fun. Central government (900km south) just seems utterly fixated on 1950’s-style fattening of motorways and building new ones rather than putting in mass-transit services. Having car-parks in that building might be a sad reflection of central government stopping pretty much all mass-transit development for about sixty years — that is, until very very recently. What needs to happen is that Auckland needs to control Auckland transport and not a whole lot of people in another city. Andrew, re your comment “Auckland needs to control Auckland transport and not a whole lot of people in another city.” – personally, I think you’ve got that completely round the wrong way. Auckland transport planning is being entirely lead by Aucklanders, via the Greater Auckland Regional Council etc, and the Auckland branch of NZTA / Transit. Honestly, politicians in Wellington have very little to do with it, except for signing off massive cheques. Same as your comment “central government stopping pretty much all mass-transit development for about sixty years” – again, that was a choice by Auckland governance, not Wellington. As far as I know. But I could be wrong. But I don’t think I am. from the Te Ara website: Sir Dove-Myer Robinson was Auckland�s longest serving mayor � from 1959 to 1965 and 1968 to 1980. He gained renown in the late 1940s by leading a successful campaign to stop the discharge of sewerage into the Hauraki Gulf. As mayor he promoted a rapid transit system, but this was sidelined in favour of roading. He had a colourful personality and was affectionately known as �Robbie�. Question is, who did the sidelining? Well with both potential mayors of Auckland grandstanding about building the CBD loop, let’s see if some of that cash diverts from the (drum roll and flowers) “Roads of National Significance” into infrastructure which would be significantly better for Auckland. Yer you are right — it seems much historical blame is to be had by ARC and co it seems, but without spending my entire working day researching and assembling notes, my understanding is that central government have had sway in proceedings. I would agree with m-d in terms of, is this building a “tour-de-force of the art of the architect” or perhaps just a visually striking building. I am much more interested on how this building fits with the context, does it pay its respects to the surrounding buildings? and should we judge a building by looking at it in a singularity or as one within the group? This is one beautiful-looking building. From what I’ve see, from the K Rd side it seems lower, and the tower is set back behind has a facade that matches the scale of the neighbouring buildings. I gather that it uses white-painted GRC, and has an abstract pattern of rectilinear forms and voids that picks up on the rhythm and depth of its context. While it looks if anything a little too timid given the rest of the building, in general it looks like a really interesting way of inserting a contemporary design into a heritage setting. On Cross St, the surroundings are diverse, “gritty” (or perhaps grotty?) and much more “service lane” in appearance, and it looks like it complements that well too. Talking about Ironbank – and other NZIA winners – this morning with Kathryn Ryan. 11.45am, Radio New Zealand, National.